What are the major types of crude oil? Crude oil is classified as ‘sweet’ and ‘sour’, depending upon its sulphur content. Sweet crude has less than 0.5 per cent sulphur content whereas sour crude has more than 0.5 per cent. Sour crude oils are cheaper than the sweeter variety. They are more complex and expensive to refine. Some of the well-known varieties of crude oil are Brent (sweet), Dubai (sour), Nigerian Bonny Light (sweet), West Texas Intermediate (sweet), Urals (CIS) (sour) and Suez Blend (sour).India largely imports the sour variety. The overall basket is much cheaper than Brent. Environmental standards in India permit higher sulphur content in petrol and diesel. What is the ‘gross refining margin’? Suppose a refinery buys one barrel of crude oil at $100. It breaks this down to various quantities of petrol, diesel, aviation turbine fuel, naphtha, kerosene, furnace oil etc. Suppose these products, as a basket, are sold at $105. In this case, the ‘gross refining margin’ is said to be $5 per barrel. The refining margin is thus the difference between the total value of petroleum products produced by the oil refinery and the price of the input i.e. crude oil. Higer the GRM's higher the Profit Yields. Gross refining margin improves: The gross refining margin (GRM) of almost all the refinery companies improved in the quarter and the year ended March 2008 compared with corresponding previous-year periods. RIL’s GRM was US$ 15.5 per barrel in the quarter ended March 2008. 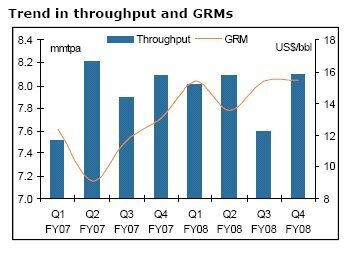 Indian Oil’s GRM improved to US$ 9.02 per barrel in FY 2008 as against US$ 4.19 per bbl in FY 2007. HPCL’s GRM was US$ 5.98 per bbl (FY 2007: US$ 4.78 per bbl) for the Mumbai refinery and US$ 6.98 per bbl (FY 2007: US$ 3.51 per bbl) for the Visakh refinery in FY 2008. Chennai Petroleum’s GRM stood at $9.59 per barrel in the quarter ended March 2008 as against US$ 6.421/per barrel in the March 2007 quarter. And RPL is expected to have a high GRM of $17/Barrel which is nearly $1.5/barrel in premium when compared to Reliance GRM. How do customs duties on petro products determine gross refining margins? For petro products manufactured by them, oil refineries in India are paid the ‘import parity price’, the international price plus the insurance and freight cost plus the customs duty. Thus, higher the customs duty, higher will be the gross refining margin. What would happen if customs duty on petro products is reduced? If the customs duty is cut, say, to 10 per cent, the domestic company would reduce its price from 15 per cent above the landed cost to 10 per cent above the import parity price. In case it does not do so, the customer, that is the marketing company, will import the product. India does not import petrol, but a cut in customs duty on petrol reduces the domestic price of petrol. What can the Government do if world oil prices keep rising? The first step should be to eliminate rate dispersion by bringing down the duties on petro products. When the customs duty on crude oil and petroleum products is equal, then this anomalous profitability of Indian refineries would be removed. But once customs duties are brought to zero, how can the Indian consumer be protected from the rise in world oil prices? While all agree that low inflation is a desirable objective, it is not desirable to achieve low inflation by artificially keeping the price of oil products low. As world oil prices rise, and show no particular signs of going back to the old levels, the economy needs to adjust itself to higher prices. If not, the Government will not only end up bearing the subsidy bill, whether itself or impose it on oil companies, but also in encouraging the consumption of oil in a world where its price is much higher. Underrecoveries are mounting for Indian public sector oil marketing companies (OMCs) due to the spike in global crude oil prices. This has lead to net losses in the March 2008 quarter by Indian Oil. Hindustan Petroleum Corporation’s (HPCL) net profit due to tax writeback was Rs 408.61 crore. Petrol, diesel, public distribution system kerosene and domestic LPG are sold at prices lower than the estimated cost of production (inclusive of refinery margin). This leads to underrecoveries for OMCs, projected around Rs 245305 crore in the year ended March 2009 (FY 2009). In view of the surging underrecoveries, the Union government increased the price of petrol by Rs 5 per liter against the required increase of Rs 21.43 per liter, diesel by Rs 3 per liter against the required increase of Rs 31.58 per liter and LPG by Rs 50 per cylinder against the required increase of Rs 353 per cylinder. There was no increase in the prices of kerosene. The Union government also reduced custom duty on crude to nil from 5% to 2.5% from 7.5% on petrol and diesel, and from 10% to 5% on other petroleum products. The excise duty on petrol and diesel was also reduced by Re 1 per litre. As a result, a significant portion of the estimated underrecoveries of Rs 245305 crore will be financed as follows: Rs 22660 crore through duty changes, Rs 21123 crore from price revision, Rs 40000 crore sharing from upstream companies, oil bonds at around Rs 135000 crore, and the balance to be absorbed by PSU OMCs. The current fiscal will be eventful with Reliance Petroleum set to commence commercial production, while the groundwork for the stalled Nagarjuna Petroleum slated to start shortly. With a slew of other projects set to come on steam in due course, India is positioning itself as a refining hub for the global markets.